Hello, how do I export a pyxel tilemap to Tiled ?. Map orientation not supported: ""
I have the same tileset loaded in Tiled and in Pyxel, ok. In pyxel I have a tilemap that I want to take to Tiled but I do not know how to do it. The first has been updated recently, the second is oldish but it may still work. The tool in github, I do not know what I should do with it, how should I use it ?. 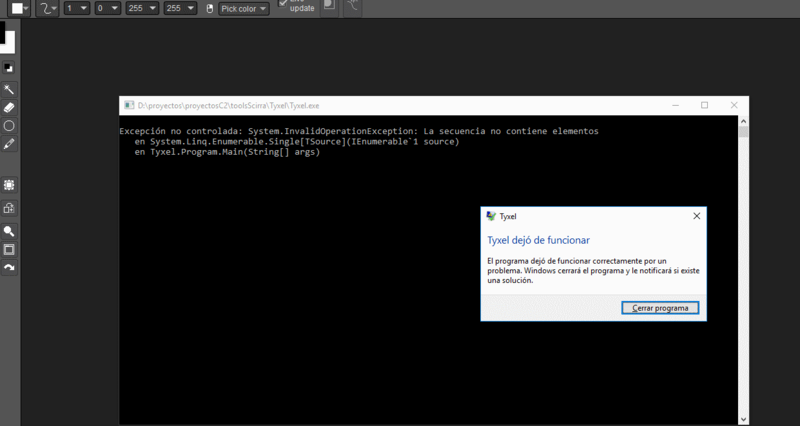 The second tool has an exe, I used it but it seems that it no longer works, the file obtained for Tiled does not look good when I opened in Tiled. When you reach the github page, click on "release" and choose Tyxel.zip, then you'll get a exe. Okay, I got it but it gives me an error. I can not run it. Hi, thanks, I can not make this file work, maybe it's a mistake ?. I am using the latest version of pyxel. This tool uses Pyxel's canvas to generate Tiled's tilesheet(this is because keeping Pyxel's tiles in order while drawing is problematic). Your *.pyxel file needs a layer called Sheet in order for it to work(must've missed that detail in the instructions). I did this edit to your file, attaching it here. Ok, in the layer that is called "sheet" I have to draw a copy of the tileset. But I have many tiles, it's crazy to tile it because it would take me a long time. Is there any way to do it quickly ?. There is no easy way to do it, you have to add them one by one to the canvas. Ouch !, then it's crazy right now for me to do a rendering of the tileset. Actually there is an easy way to do it! Oh.. pff that's right, hah good thinking Ragath. Edit: ok I understand !. That helped me!, I already have the output folder. Now what should I do in Tiled ?. The json file in the "output" folder is not recognized in Tiled. The other file is a png image with the tileset. Ok, I can take the contents of the "sheet" layer to Tiled, but the content of this layer is the tileset. Now I also want to take the tilemap that I have in Pyxel to be able to bring it to Tiled. That is to say. I want everything in Tiled, tilemap and tileset, is it possible? Currently with Tyxel you can have the tileset ("sheet" layer) in Tiled, but I also want the tilemap that is in the other layer in Pyxel. Tyxel does not currently export any tile layers, doing so would either prevent placing tiles in Tiled(and defeat the purpose) or require duplex communication. Duplex communication is generally messy and error-prone, so i'm not looking at that as an option and it would prevent using a lot of features in Tiled that Pyxel cant support. Hopefully soon Pyxel can export to Tiled.